President Obama To Give Commencement Speech At Rutgers University In New Jersey! - Ooooooo La La! 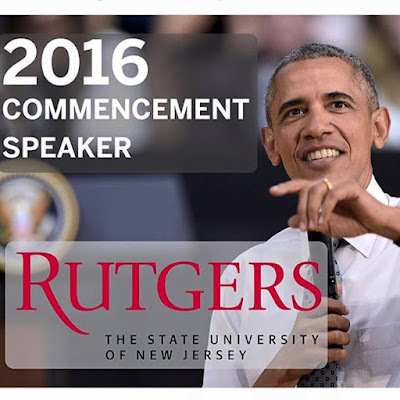 President Obama To Give Commencement Speech At Rutgers University In New Jersey! President Barack Obama will speak at Rutgers University's 250th anniversary commencement, the White House announced earlier today (April 14). This year's graduation ceremony is on May 15 at High Point Solutions Stadium in Piscataway. "This is the first time in Rutgers University's history that a sitting president has agreed to speak at commencement," University President Robert Barchi said. Obama will also be the commencement speaker at Howard University and United States Air Force Academy. Well, guess who gets to see him? Me!!! My brother graduates from Rutgers this May and I'll be in attendance, yay!